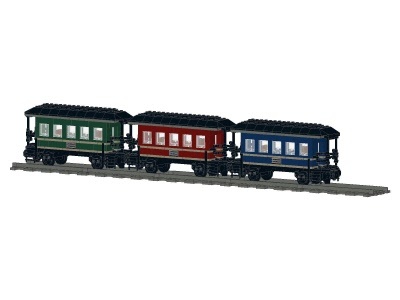 Passenger wagons with a characteristic platform on each side. The platforms are closed off by openable gates, leading to the next wagon or down the stairs. Can be build with or without handrails for the stairs. In the interior you can find chairs for placing minifigs, but these can also enjoy fresh air on the platforms. Roof can be lift off to place minifigs. Very close coupling mechanism in between wagons.